482 in stock Need More ? Exam Board: AQA Level: GCSE Grade 9-1 Subject: English Language First Teaching: September 2015, First Exams: June 2017 Let's face it, exams can be tricky. Because everyone has different strengths when it comes to test taking, this new Snap Revision guide from Collins helps you focus on areas of your revision that you find tricky or need extra practice in. This is no ordinary GCSE Grade 9-1 English Language revision guide - it's focussed revision designed to help you with the writing component of papers 1 and 2 in the AQA GCSE Grade 9-1 exam. Spaced practice opportunities allow you to test, revisit and review understanding throughout your revision. 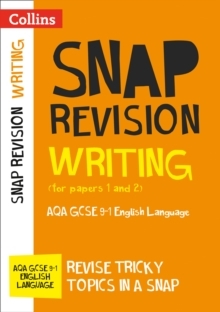 Ideal to use at home for extra practice, revising tricky topics is a snap with this Collins Snap Revision guide for writing. Need to brush up on your reading skills too? Reading for papers 1 and 2 (9780008218089) is another excellent GCSE Grade 9-1 revision guide that will get you ready for your AQA English Language exam.